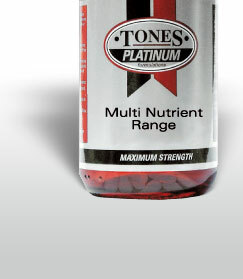 TONES PLATINUM Range has an enviable reputation as being of the highest quality, with consistency of ingredients and proven usage. We are proud of this history and will continue to adhere to these very strict standards, delivering the best possible health solutions. This superior standard automatically positions our product as being a premium brand and in our pricing we will demonstrate value, which means the best solution for your money. We have chosen to deliberately stand apart from the growing mega-mass of ordinary products, which predominantly sell on price. Instead, we have chosen a niche market position where our products will stand on their own and be chosen by those who value quality of ingredients and results, backed by excellent product information.